Kentucky Lake is the largest man-made lake in the eastern United States. It backs up the Tennessee River for 184 miles and spans nearly the entire width of Tennessee into Kentucky. At normal operating level, it covers 160,300 acres. It’s a maze of islands inlets plus wide open spaces. Why does that matter to North Louisiana fishermen? Because when the Crappie Masters 2015 National Championship kicks off there this week, our area will be well represented. Not only that, the Crappie Masters tournament trail will be back here in our backyard on Lake D’Arbonne in just over four months for the Louisiana State Crappie Championship. For our locals, the Nationals is a story of three different paths to the tournament. Jay Stone and John Godwin of West Monroe fished their first-ever Crappie Masters event here this spring and won it. They are putting their undefeated record on the line in Kentucky. Farmerville resident James Morgan and his son-partner, Chuck Morgan, have fished numerous events and finished 13th in the tournament here. It will be their first Nationals try. The local veteran of the event will be Ron Nobles of Farmerville. He has fished competitive crappie events, including the Nationals, for 31 years. He will be meeting his partner Ron Shannon from Missouri at the tournament. Ron moved here several years ago. Today we’ll take a look at Morgan and Nobles’ approaches ( tomorrow look at Stone and Godwin’s plans, including a photo of Godwin’s super secret bait!). Louisiana has two other teams at the Nationals, Terry Richard and Casey Rayner and Terry and Travis Brown. The Browns finished in eighth place here on D’Arbonne this spring and Richard and Raynor finished 44th. They all fish numerous Crappie Masters events. For James Morgan and his son, Chuck of Natchitoches, they would love to win, but just hope for a good showing. They plan to become more regular on the crappie circuit. James loaded up his boat and travel trailer and headed to Kentucky Lake last weekend. He’s been having fun, learning about the new lake and burning up enough gas to where he’ll need to win something or get a part-time job to get home. Like a good dad, he’s doing the leg work and meeting Chuck a day before the tournament. Morgan found a couple of spots and landed some good fish, as you can see here. He plans on trying to find enough spots and techniques that work so he can change if the fish do. 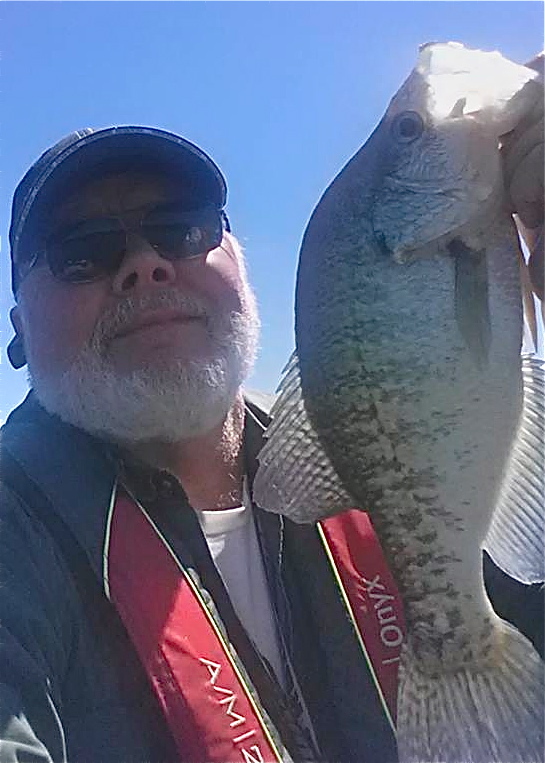 If you get on a mess of crappie, it doesn’t take long to get a seven-fish daily limit. They key is good, quality fish. James is also manning a display for the Union Parish Tourist Commission to promote our area for next year’s D’Arbonne tournament. “You think these are money fish?,” he texted along with the photo shown in this writeup. I think so. Nobles has been to Kentucky Lake several times. His experience will help, but won’t be a big advantage.